It is hardly surprising that, when reflecting on his VFL career, Ken Veevers saw himself as more of a Fitzroy footballer than a Collingwood player. Veevers played only one match with the Magpies in his sole season at the club, 1929. His three seasons at Fitzroy at least saw him play 18 matches between 1930 and 1932. Veevers was born and raised in Richmond. He loved sport from the outset, and was rewarded for his passion as a 14-year-old when he was awarded the “champion boy” medal of North Richmond State School in 1923. He played his early football in the Richmond region, playing for a period with the Northern District side. A stitcher with football manufacturer Sherrin, Veevers used to work with a close friend of his, Collingwood’s champion full-back, Charlie Dibbs. It is believed that Dibbs encouraged his workmate to try his luck down at Victoria Park in the late 1920s. He could hardly have chosen a more difficult season in which to try to break into the Magpie team. 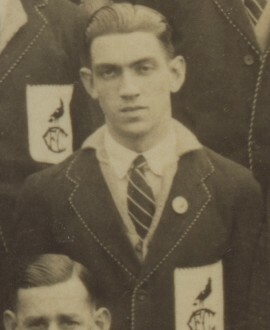 Veevers joined the club at a time when “the Machine” was running at its optimum, so much so that the club chose the same team for six straight weeks at one stage of the 1929 season. Eventually, the 178cm, 70kg hopeful won a slot in the team for the Round 9 clash with Footscray at Victoria Park. Fittingly, he played in the back pocket alongside his mate Dibbs, with another newcomer, the ill-fated Charlie Ahern, making his debut in the other back pocket. Veevers and Dibbs would remain lifelong friends. While Veevers performed creditably in that first game, he was omitted the following week and didn’t play again for the seniors. Realising his opportunities were limited at Collingwood, he decided to transfer to the Brunswick Street Oval for the 1930 season. He played for the Maroons for three seasons, almost always in the back pocket or half-back flank. After one game against Footscray in 1931, the Argus singled him out for his “dashing, courageous and safe” play out of the last line of defence. While the Maroons struggled and never finished higher than ninth in Veevers’ time with the club, he thoroughly enjoyed the experience. Years later he fondly recalled one of the club’s football trips to Tasmania. Veevers proudly carried pictures of that particular venture in his wallet for the rest of his life. Long after his football career was finished, Veevers enlisted as a private in the Australian Army. He spent more than a year serving in the Northern Territory. A dapper individual, Veevers had a distinctive white streak through his hair, even in his football days. He married his wife, Veronica, prior to Christmas in 1933. The pair had no children. Veevers turned to lawn bowls late in his life, joining Princes Park Bowling Club. Sadly, he died there from a heart attack in 1973, aged 63.